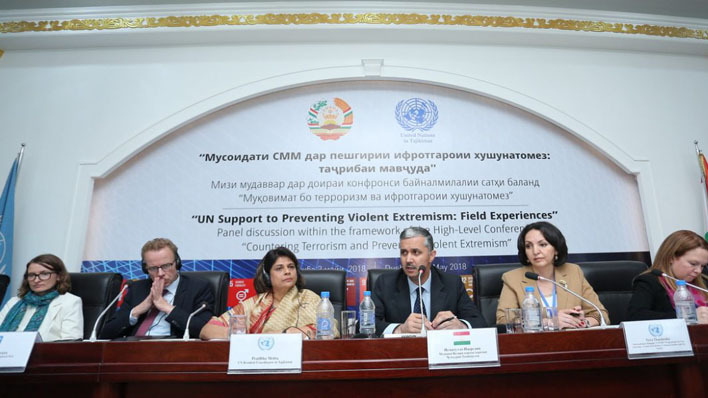 3 May 2018, United Nations in partnership with the Government of Tajikistan held the panel discussion “UN Support to Preventing Violent Extremism: Field Experiences” in the National Library of Tajikistan. A discussion is a side event within the framework of the High-level International Conference “Countering Terrorism and Preventing Violent Extremism”. Co-organized by the Government of the Republic of Tajikistan, this side event of the High-level Conference was attended by nearly 160 representatives of high-level government and UN entities, official delegations to the Conference, diplomatic missions, civil society organizations, development partners, think tanks, international and regional organizations, as well as religious leaders. The panel discussion aims to share knowledge and experience on Preventing Violent Extremes and to present UN tools, knowledge products and approaches that support countering violent extremism. During the discussion, Ms. Lina Benete, Head of Education, UNESCO Almaty Cluster Office introduced its policy framework of the Education for Sustainable Development and Global Citizenship Education, providing pedagogical approaches and activities in Prevention of Violent Extremism (PVE). Panelists and participants of the discussion noted that comprehensive development programmes, which address youth vulnerabilities and empowerment of women, are critically needed to reduce the scale, scope and future risk of violent extremism while building more inclusive economies and governance systems. In this context, the Sustainable Development Agenda provides a framework for progress through the creation of peaceful, just, inclusive, and economically progressive societies.